For those immediately impacted, this decision means that certain visa holders and applicants from the following countries will continue to be banned indefinitely from travel to the U.S.: Iran, Libya, North Korea (well below 1,000 visitors per year), Somalia, Syria, Venezuela (only certain government officials and their families), and Yemen. However, the broader consequences of this decision could be far more grim. The Court reversed the Ninth Circuit Court of Appeals which upheld injunctions halting the President Trump’s most recent Muslim Ban—Proclamation 9645. Chief Justice Roberts wrote the majority opinion, discussed below. While Justices Kennedy and Thomas wrote concurrences and Justices Breyer and Sotomayor wrote dissents, those will not be analyzed herein. On statutory grounds, the Court held that the Proclamation is within the broad discretion granted to the president by Congress under the Immigration and Nationality Act (INA), more specifically, 8 U.S.C. §§1182(f) and 1185(a). On Constitutional grounds, the Court permanently struck down the District Court’s injunction, holding that the Proclamation is not likely violative of the Establishment Clause of the First Amendment of the U.S. Constitution. With the injunction denied, the Muslim Ban will continue to be in effect while the District Court can now rule fully on the constitutionality of the Proclamation—knowing that the Supreme Court has clearly signaled that it is likely to find the Muslim Ban constitutional. Chief Justice Roberts, following cited precedent, applied the “rational basis test” to the Proclamation. This test asks whether the government has a rational basis for this policy. That is, is the Muslim Ban “plausibly related” to “protect[ing] the country and improv[ing] vetting processes?” This test is a notoriously easy one to pass, failing only when “the laws at issue lack any purpose other than a ‘bare… desire to harm a politically unpopular group.’” While the Muslim Ban sounds like a common sense candidate for failure, the majority uncritically took for gospel every vague, unsubstantiated, and ex post facto national security pretext the president presented in the Executive Orders and Proclamation, while simultaneously ignoring the role of every bigoted justification the president proffered beyond the text itself. The Court also ignored the complete disconnect between the countries listed in the Proclamation and those who have actually been implicated in the commission of criminal acts on U.S. soil. Notably, in finding a blanket travel ban on categories of travelers convincing over case-by-case analysis of applicants by consular officers, Roberts wrote that “fraudulent or unreliable documentation may thwart [consular officers] review in individual cases.” As if the president has clairvoyance sufficient to know whether an individual applicant is fraudulent better than the consular officer who personally reviews the relevant documentation. While Roberts mentioned the availability of waivers under the Muslim Ban, a point the Government invoked repeatedly during oral arguments, there is no evidence that any have actually been granted. The main argument presented is that the Muslim Ban applies to the admissibility of aliens, whereas §1152’s prohibition to discrimination applies only to the issuance of visas, a later and more specific step in the process of gaining entry. As such, a limitation on a specific part of a process cannot be interpreted to apply to the whole process. The majority did not acknowledge, of course, that discrimination in the admissibility of aliens will necessarily lead to discrimination in the issuance in visas. A person cannot be issued a visa if that person is not eligible for it in the first place. Throughout the opinion Roberts granted the President great deference in presenting justifications for the Muslim Ban. Generally, deference is structurally appropriate: the judiciary is not constitutionally entrusted with ensuring the national security or creating immigration policy. However, the judiciary is required by our constitutional system to interpret and declare the outer bounds of the authorities of the branches which are entrusted to secure our nation, especially when those bounds conflict with individual rights. In order to side-step this duty, the majority cited some of President Trump’s Islamophobic statements, only to write, “But the issue before us is not whether to denounce the statements. 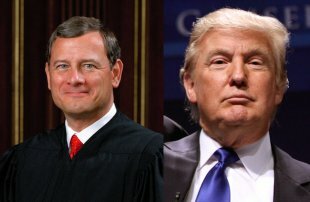 It is instead the significance of those statements in reviewing a Presidential directive, neutral on its face, addressing a matter within the core of executive responsibility.” Roberts afforded President Trump’s extra-textual statements no significance whatsoever, allowing him to dismiss the president’s well-documented, open, heinous, and discriminatory basis for the Muslim Ban. Discriminatory intent (unless it is against fundamentalist Christians, of course) and discriminatory impact hold no weight for this majority: the only evidence this Supreme Court will accept is blatant and textual, a willful disregard to nearly every instance of discrimination in this country’s history. Once textual discrimination is set ablaze, more clever forms rise from the ashes. The holding further argues that the Proclamation cannot be discriminatory against Muslims, as it covers only 8% of the world’s Muslim population. Yet again, Roberts willfully disregards how discrimination law actually works. When an employer discriminates against a female employee, for example, the female employee is not required to prove that the employee discriminated against every female in the world, or even every female in the workplace. The female employee need only prove discrimination in her case. Here, the majority is permitting the president to discriminate against 8% of the world’s Muslims because he has not yet discriminated against the other 92%. Importantly, nothing in the opinion limits President Trump from adding more countries to the Muslim Ban list at a whim, only to later claim security justifications to retrofit his proclivities. As the Court has signaled no intention of looking behind the president’s pretext for discrimination, future legal challenges will be discouraged and will likely be unfruitful. However, the most troubling and broad consequence of this decision is that the majority makes clear that a president can justify nearly any discriminatory policy, and can speak openly about the bigoted goals of that policy, as long as the policy itself is written in a facially neutral way. Beyond this narrow area of law, if the Court continues to be wholly unwilling to pierce the veil of the vague concept of national security as a justification for any policy conceivably related thereto, the authority of the presidency will grow well beyond the Court’s or Congress’s ability to constrain it. During the entire Muslim Ban saga, from the first Executive Order promulgated during the dawn of 2017 through today, President Trump has relied primarily upon authority from Congress granted under the INA. However, Congress has thus far made no serious attempt to change the INA and undermine that grant of authority. In this statutory ruling, the Court reminded Congress of existing tools necessary to undermine the Muslim Ban. We must ensure they are put to use.